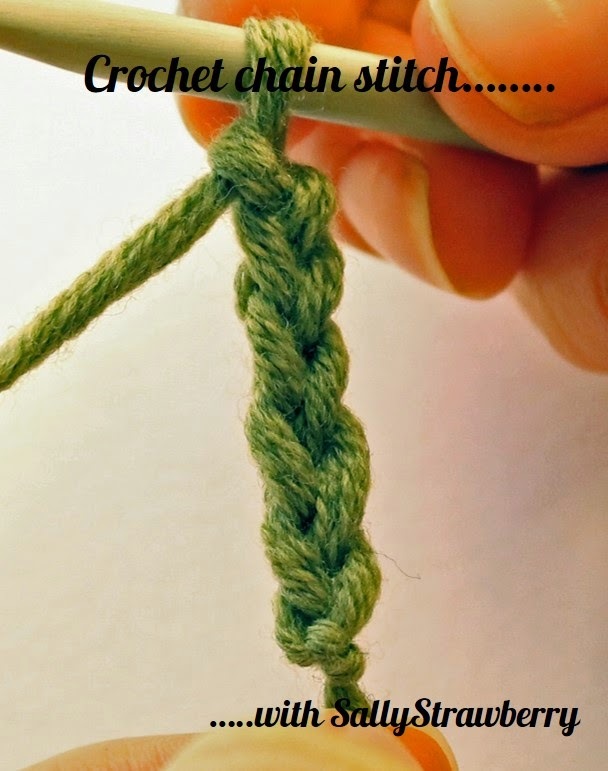 Once you have mastered the slip knot (and please don't worry if it takes you a while) the chain stitch is without a doubt the most important crochet stitch. Not only is it used in lovely lacy patterns it forms the foundation of loads of crochet projects. So, whether you like it or not it is a stitch you will have to learn. I hope these step-by-step photos can guide you through easily. First though, a little bit about holding the yarn and hook. This is often the trickiest thing to conquer for those new to crochet but is the most adaptable. Really, you can hold the yarn and hook however you like as long as you do so in a way that ensure even stitches in your work. The below is just a suggestion but experiment and find the best way for you. 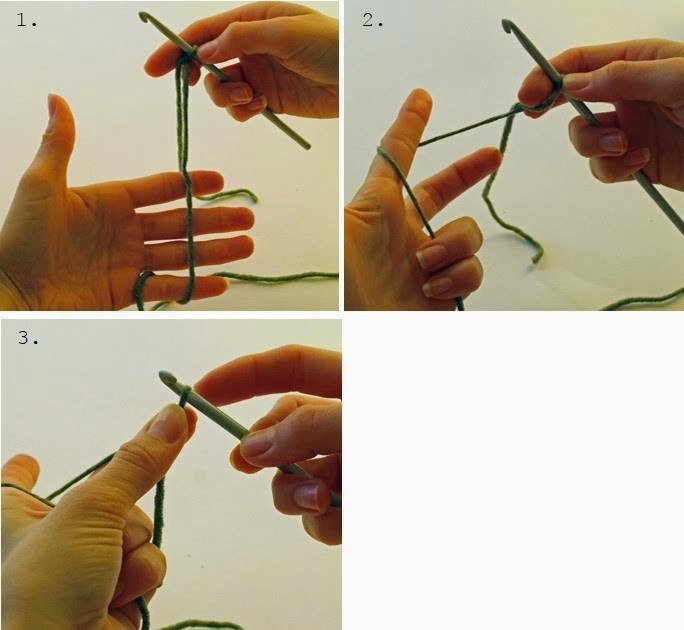 If you are right-handed the most common way of holding hook and yarn is hook in right hand, yarn in left (and if you are left-handed to hold the hook in your left hand and the yarn in your right). Many people however hold both hook and yarn in the same hand (long-term knitters for example!). What you are aiming to do here is hold the yarn so that it is taut, giving you more control with your stitches. 1. Wrap the yarn around your little finger– some people wrap once, others twice. 2. 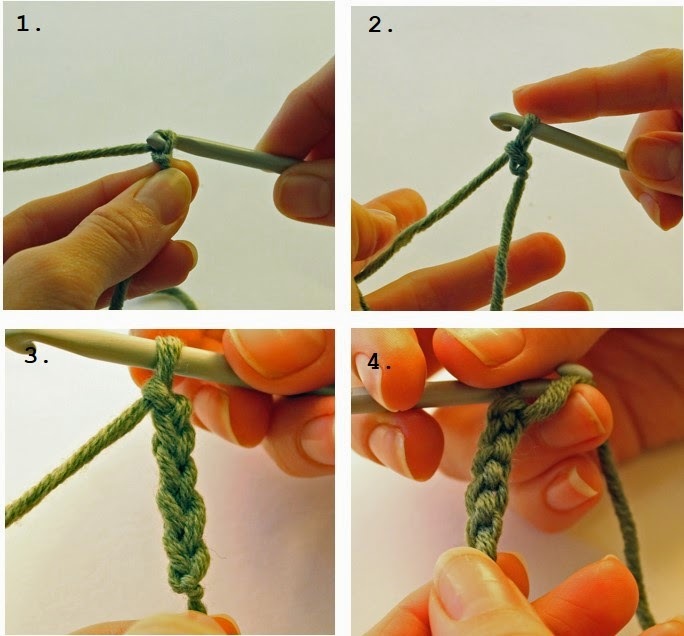 Close your fingers to hold yarn and hold it taut with your index finger. 3. This is the most important part. Always make sure you have hold of the slip-knot or the stitch nearest the hook. This ensures even stitches. 1. Hook the yarn, or wrap it over the hook (called ‘yarn over’ ) and pull it through the stitch already on the hook. 2. You have one chain stitch!Remember to re-adjust so you are holding the yarn at the hook. Continue step 1 until you have as many chain stitches as you require. 3. Here is the top view of the chain stitch. Each ‘V’ is a stitch. 4. Here is the view of the bottom. So, for every chain stitch there is a ‘V’ on top and a bump on the bottom! 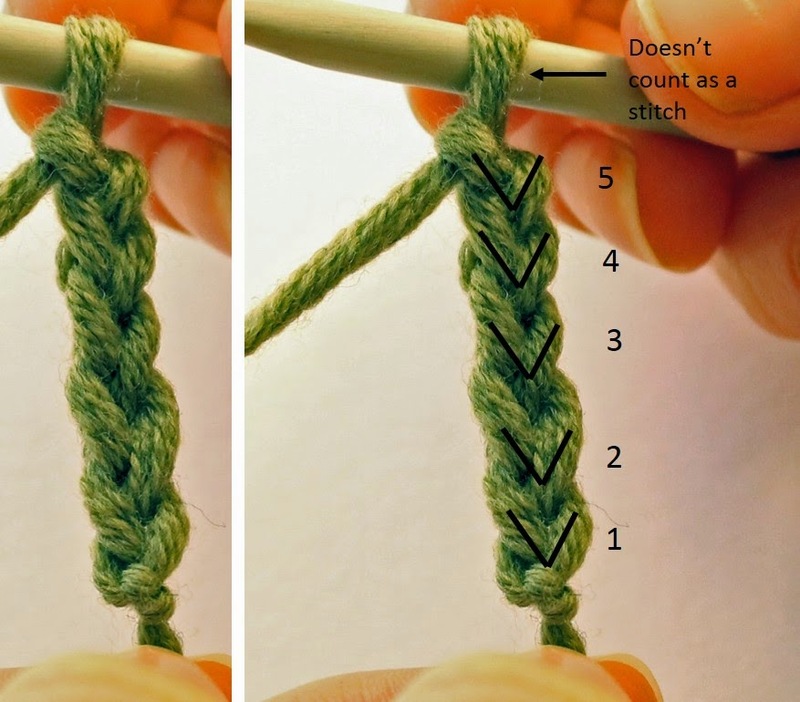 When counting your chain stitches, each 'V' is a stitch, as illustrated below. The slip knot you make to start off your chain does NOT count as a stitch! Although it looks easy, it can take a bit of practice to get your chain stitches looking even, so just keep trying and you will get there in no time! Up next, the double crochet stitch! Happy hooking!